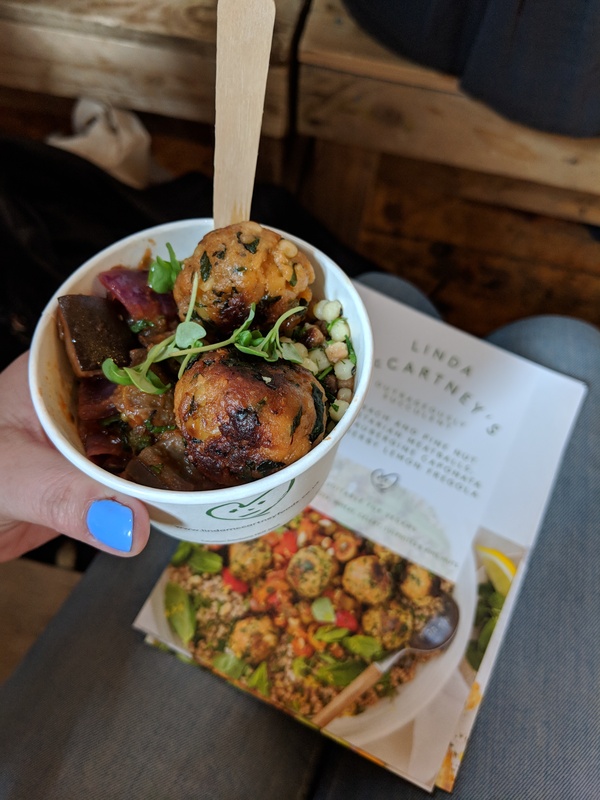 It’s National Vegetarian Week this week, and to celebrate I attended a cooking demo with Linda McCartney’s head chef last weekend in Bristol. 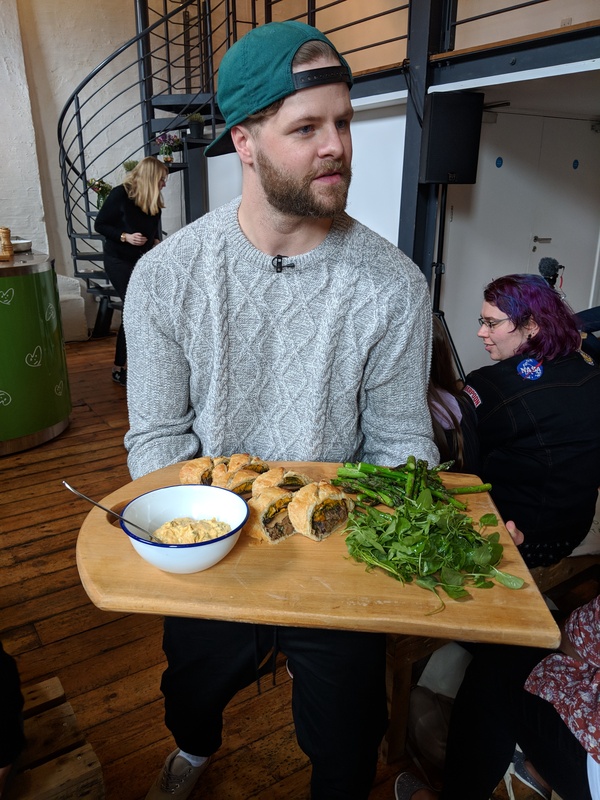 Held at The Paintworks, Jay McGuiness (of The Wanted) also attended, sharing with us some of his favourite veggie meals. Named ‘Linda’s Veggie Table’, the event took place in both Bristol and London. 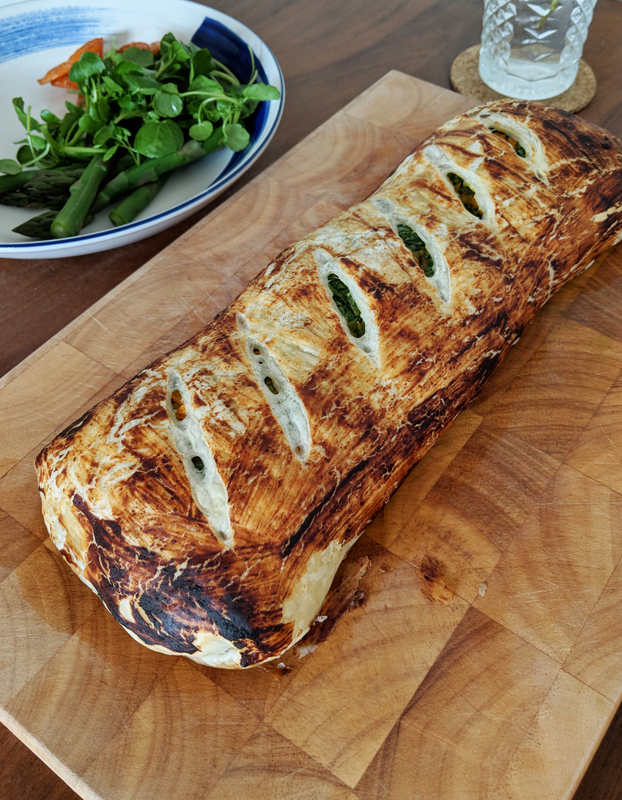 The team at Linda McCartney incorporated products from her new vegan line, into each dish, including their veggie burgers for this delicious puff pastry vegan wellington, complete with vegan Bernaise sauce. 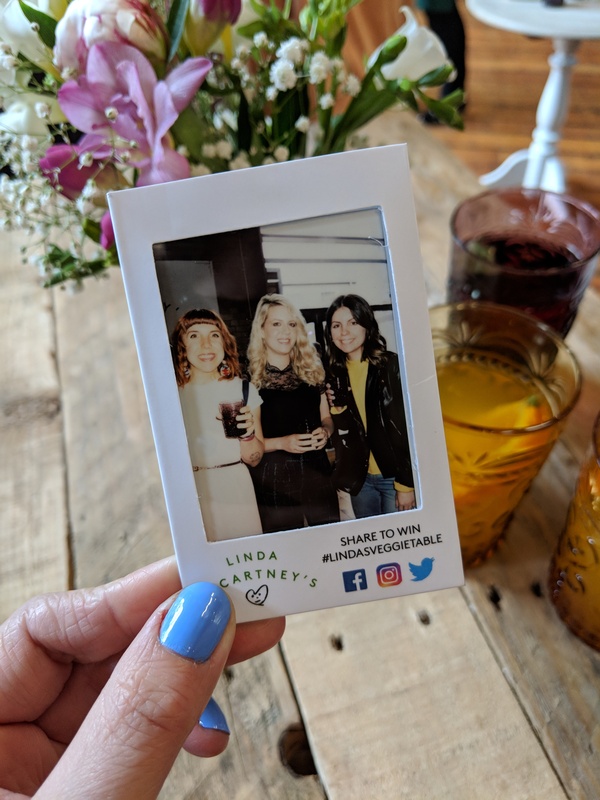 The event itself was beautiful, with lots of herbs, fresh flowers, colourful mocktails and a delicious all vegan menu. 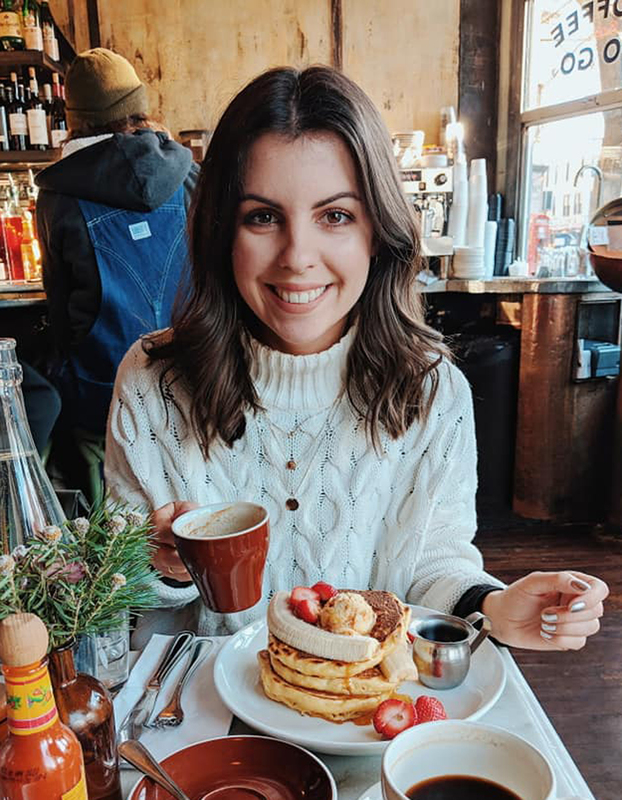 I attended with a couple of friends who are vegan and they both really enjoyed the food, taking away lots of inspiration. As did I! Although I’m not vegan, I do enjoy eating lots of vegan/vegetarian food, and tend not to cook meat at home. So I really enjoyed tasting the variety of food the team made for us. There were really unique dishes. 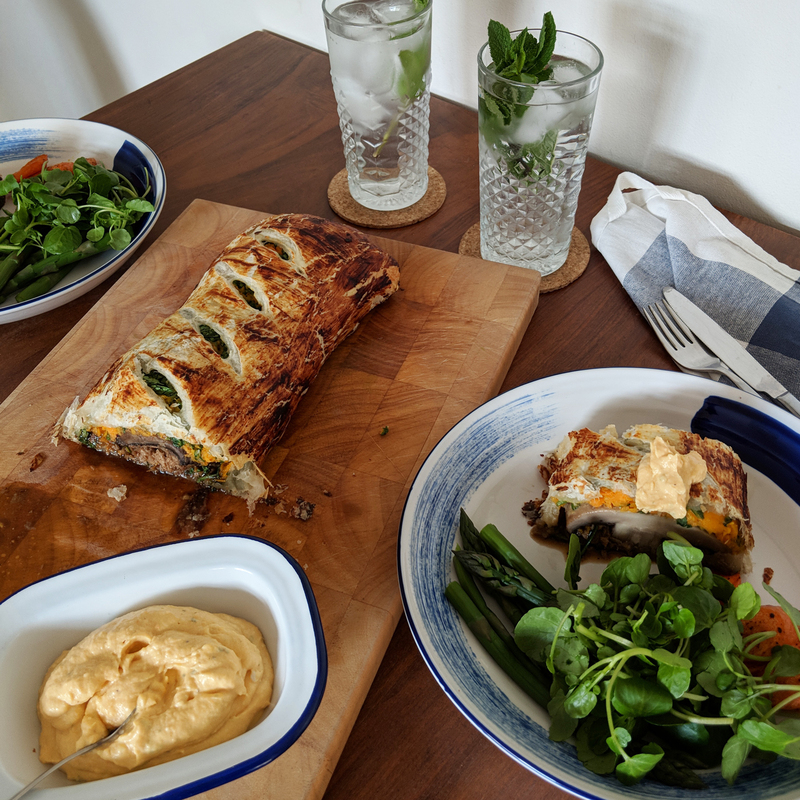 Alongside this vegan wellington (which I couldn’t help but share), was a vegan ‘meat’ ball fregola salad, sweetcorn fritters, hoisin ‘duck’ sushi and vegan ‘chorizo’ sausages. Linda’s Veggie Table will hopefully be on again next year, and I’d highly recommend it! Whether you’re vegetarian, vegan or flexitarian, there’s inspiration for everyone. 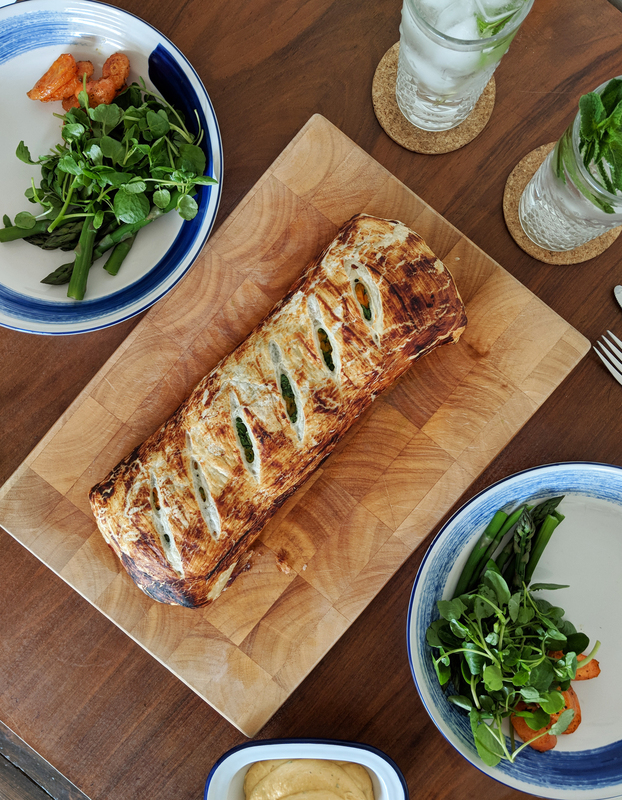 We chose to pair our wellington with watercress, carrots and asparagus, but you can choose any vegetables you like, or perhaps even a salad to make it more summery. Pre-heat the oven to 180 degrees. Place your sweet potato on a baking tray and cook for 30 mins. Remove from the oven and stand to cool, before peeling and mashing in a bowl. Meanwhile place the mushrooms upside down on another baking tray. Mix half of the miso paste with the oil. Brush the paste over the mushrooms and cook for 15 minutes. Allow to cool and place to one side. Mix 3/4 of your sweet potato with the chopped spinach, in a bowl, and season. Reserve 1/4 of the sweet potato for the bernaise sauce later. Mix the burgers with the chopped parsley, rosemary and onion jam in a bowl. Season well. 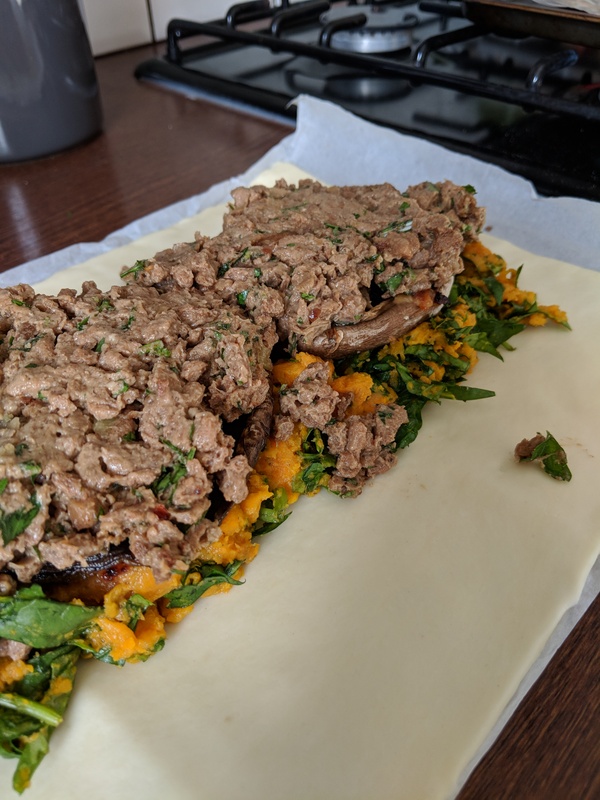 Unroll the pastry and spoon the sweet potato and spinach mix in a wide strip of about 6cm, down the middle lengthways, leaving a 3cm gap at either end. Lay mushrooms upside down on top of the sweet potato mix. Spoon over the burger mix. Mix the remaining miso paste with almond milk. Brush the mixture all over the pastry left visible. Fold the two ends of the pastry in, and then the two sides, so that the all over lap securely in the middle. 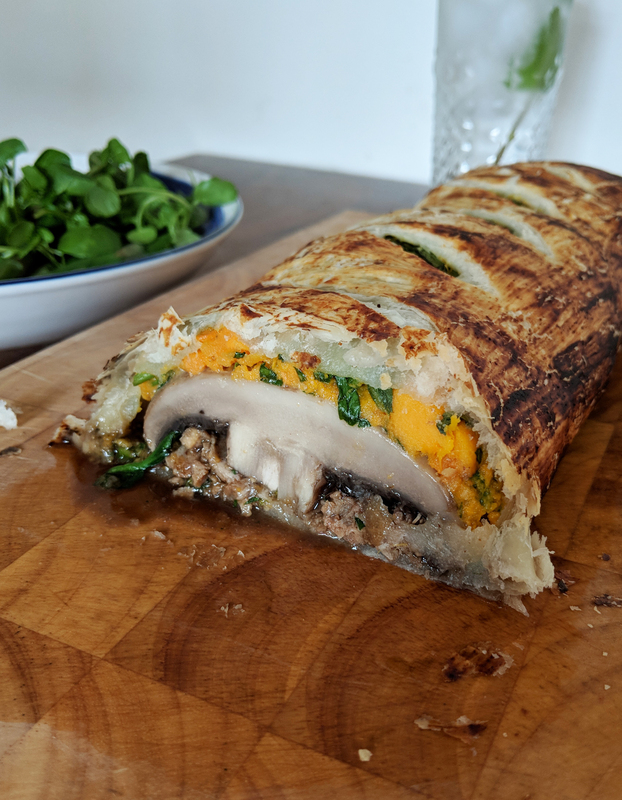 Flip the wellington over and brush the pastry with more miso/almond milk. 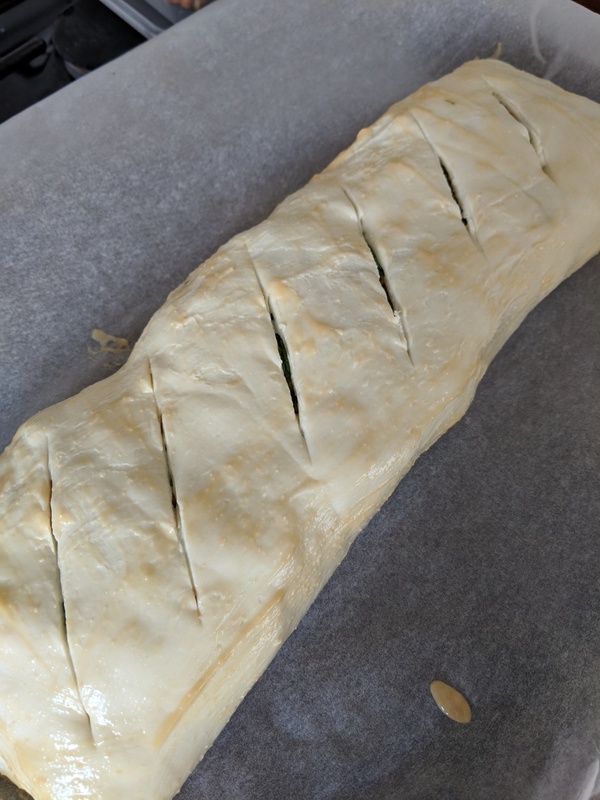 Cut a couple of lines down the wellington, to let air escape in the oven. Place on grease proof paper on a baking tray and bake for 30 minutes, or until golden brown. Blend the remaining sweet potato, tofu, vegan margarine and white wine vinegar together. Add the tarragon and season with salt and black pepper, mix together well. Serve on the side of the wellington. And I must say, the Bearnaise sauce tastes SO similar to the real deal. So much so in fact, I have no idea why we don’t all eat vegan Bearnaise!